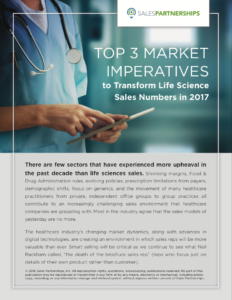 There are few sectors that have experienced more upheaval in the past decade than life sciences sales. Shrinking margins, Food & Drug Administration rules, evolving policies, prescription limitations from payers, demographic shifts, focus on generics, and the movement of many healthcare practitioners from private, independent office groups to group practices all contribute to an increasingly challenging sales environment that healthcare companies are grappling with. Most in the industry agree that the sales models of yesterday are no more. The healthcare industry’s changing market dynamics, along with advances in digital technologies, are creating an environment in which sales reps will be more valuable than ever. Smart selling will be critical as we continue to see what Neil Rackham calls, “the death of the brochure sales rep” (reps who focus on just the details of their own product rather than customer). Click here to download the free whitepaper now.